A few days ago, I asked around to see who was interested in doing a guest review here. Twitter pal Darren, aka @GalileosBane over there, not only said yes, but he sent me the review the very next day. Look closely at the picture above, too, and you'll see Darren has framed the prizes from one of my contests. Very cool! 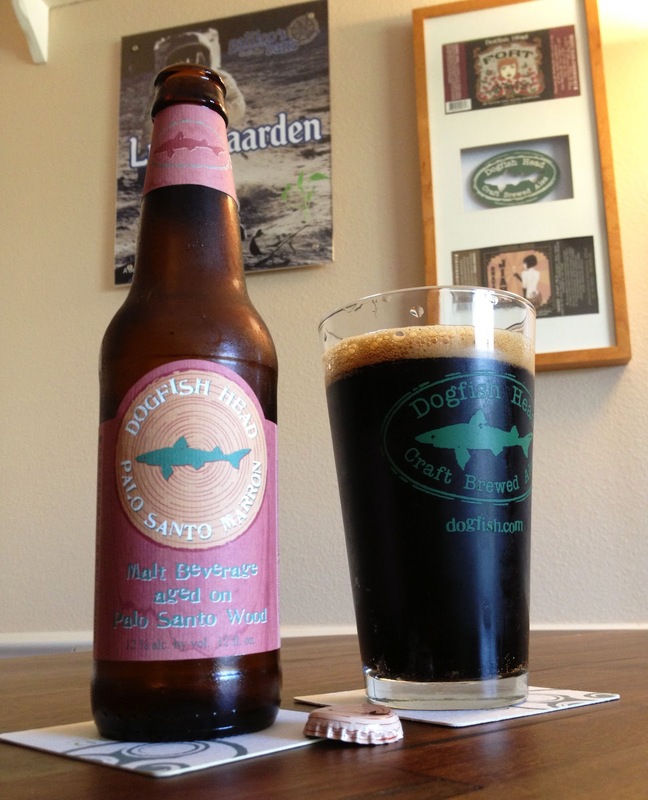 This afternoon, I decided to open up a Palo Santo Marron, by Dogfish Head Craft Brewery, based in Milton, DE. I'll be honest, I'm halfway through and ready for a nap, but not because it's boring. It is anything but boring. The 12% ABV and the rich full flavor of this “brown ale” has slowed me down. Hey, can you toss me a pillow please? This is an intense beer. Labeled as a brown ale, the Palo Santo Marron is much much more. Deep brown to black in color with a creamy espresso-like head, this beer packs in the flavor, malty with a liqueur (maybe brandy) bite, and the woody flavor from aging. This beer has a mellow mouth feel and the flavors linger on the tongue and lips. The alcohol is concealed well in all the flavor. You feel the alcohol quicker than you taste it. 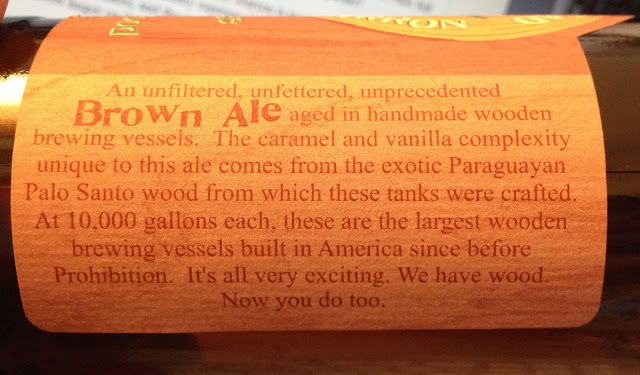 The label on the side brags about the 10,000 gallon wooden vessel created just for this beer, and tends to sum up this beer better than I could anyway. The Palo Santo tree is found in South America (Paraguay), and Palo Santo is Spanish for holy tree. A Google search will reveal photos of the not-so-impressive looking tree, but the flavor is good, and oak aging would be too mainstream for Dogfish. Like other wood aged beers, the flavor is a definite part of the beer, dominant really only at the finish. This is a beer to drink slowly and enjoy. On some weekend evenings, when I sit around the house tweeting while the TV or music are on in the background, I enjoy the Palo Santo Marron as the last beer. And when it's complete I'm ready for a nice night of rest.